Modern Hebrew or Israeli Hebrew (עברית חדשה, ʿivrít ḥadašá[h], [ivˈʁit χadaˈʃa] – "Modern Hebrew" or "New Hebrew"), generally referred to by speakers simply as Hebrew (עברית Ivrit), is the standard form of the Hebrew language spoken today. Spoken in ancient times, Hebrew, a member of the Canaanite branch of the Semitic language family, was supplanted as the Jewish vernacular by the western dialect of Aramaic beginning in the third century BCE, though it continued to be used as a liturgical and literary language. It was revived as a spoken language in the 19th and 20th centuries and is the official language of Israel. Modern Hebrew is spoken by about nine million people, counting native, fluent, and non-fluent speakers. Most speakers are citizens of Israel: about five million are Israelis who speak Modern Hebrew as their native language, 1.5 million are immigrants to Israel, 1.5 million are Arab citizens of Israel, whose first language is usually Arabic, and half a million are expatriate Israelis or diaspora Jews living outside Israel. The organization that officially directs the development of the Modern Hebrew language, under the law of the State of Israel, is the Academy of the Hebrew Language. The most common scholarly term for the language is "Modern Hebrew" (עברית חדשה‎ ʿivrít ħadašá[h]). Most people refer to it simply as Hebrew (עברית‎ Ivrit). Modern Hebrew, the language of the modern State of Israel. Jewish contemporary sources describe Hebrew flourishing as a spoken language in the kingdoms of Israel and Judah, during about 1200 to 586 BCE. Scholars debate the degree to which Hebrew remained a spoken vernacular following the Babylonian captivity, when Old Aramaic became the predominant international language in the region. Hebrew died out as a vernacular language somewhere between 200 and 400 CE, declining after the Bar Kokhba revolt of 132–136 CE, which devastated the population of Judea. After the exile Hebrew became restricted to liturgical use. Hebrew had been spoken at various times and for a number of purposes throughout the Diaspora, and during the Old Yishuv it had developed into a spoken lingua franca among the Jews of Palestine. Eliezer Ben-Yehuda then led a revival of the Hebrew language as a mother tongue in the late 19th century and early 20th century. Modern Hebrew used Biblical Hebrew morphemes, Mishnaic spelling, and Sephardic pronunciation. Many idioms and calques were made from Yiddish. Its acceptance by the early Jewish immigrants to Ottoman Palestine was primarily due to support from the organisations of Edmond James de Rothschild in the 1880s and the official status it received in the 1922 constitution of the British Mandate for Palestine. Jews from Arab lands introduced many loanwords from Arabic (e.g. 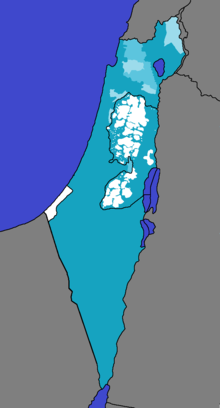 na'ana, zaatar, mishmish, kusbara, ḥilba, lubiya, hummus, gezer, rayḥan, etc.). The words gerev (sing.) / garbayim (pl.) are now applied to "socks," a diminutive of the Arabic ğuwārib ("socks"). Ben-Yehuda codified and planned Modern Hebrew using 8,000 words from the Bible and 20,000 words from rabbinical commentaries. He also invented some words, such as ḥatzilīm for eggplants (aubergines) and ḥashmal for electricity. As no Hebrew equivalent could be found for the names of certain produce endemic to the New World, they devised new Hebrew words for maize and tomato, calling them tiras (Heb. תירס) and ʿagḇaniyyah (Heb. עגבניה), respectively. The latter word is derived from the shape of the vegetable, which resembled a buttocks (Heb. ʿagaḇīm). Sometimes, old Hebrew words took on different meanings altogether. For example, the Hebrew word kǝvīš (כביש‎), which now denotes a "street" or a "road," is actually an Aramaic adjective meaning "trodden down; blazoned", rather than a common noun. It was originally used to describe "a blazoned trail." One of the phenomena seen with the revival of the Hebrew language is that, occasionally, old meanings of words were changed for altogether different meanings, such as bardelas (ברדלס‎), which in Mishnaic Hebrew meant "hyena", but in Modern Hebrew now means "cheetah;" or shezīph (שְׁזִיף‎) which is now used for "plum," but formerly meant "jujube." The word kishū’īm (formerly "cucumbers") is now applied to a variety of summer squash (Cucurbita pepo var. cylindrica), a plant native to the New World. For a simple comparison between the Sephardic and Yemenite versions of Mishnaic Hebrew, see Yemenite Hebrew. Modern Hebrew is classified as an Afroasiatic language of the Semitic family and the Canaanite branch of the North-West semitic subgroup. While Modern Hebrew is largely based on Mishnaic and Biblical Hebrew as well as Sephardi and Ashkenazi liturgical and literary tradition from the Medieval and Haskalah eras and retains its Semitic character in its morphology and in much of its syntax,[page needed] the consensus among scholars is that Modern Hebrew represents a fundamentally new linguistic system, not directly continuing any previous linguistic state, being a koiné language based on historical layers of Hebrew, as well as incorporating foreign elements, mainly those introduced during the most critical revival period between 1880 and 1920, as well as new elements created by speakers through natural linguistic evolution. A minority of scholars argue that the revived language had been so influenced by various substrate languages that it is genealogically a hybrid with Indo-European. These theories have not been met with general acceptance, and the consensus among a majority of scholars is that Modern Hebrew, despite non-Semitic influences, can correctly be classified as a Semitic language. Modern Hebrew is written from right to left using the Hebrew alphabet, which is an abjad, or consonant-only script of 22 letters based on the "square" letter form, known as Ashurit (Assyrian), which was developed from the Aramaic script. A cursive script is used in handwriting. When necessary, vowels are indicated by diacritic marks above or below the letters known as Nikkud, or by use of Matres lectionis, which are consonantal letters used as vowels. Further diacritics like Dagesh and Sin and Shin dots are used to indicate variations in the pronunciation of the consonants (e.g. bet/vet, shin/sin). The letters "צ׳", "ג׳", "ז׳", each modified with a Geresh, represent the consonants [t͡ʃ], [d͡ʒ], [ʒ]. [t͡ʃ] may also be written as "תש" and "טש". [w] is represented interchangeably by a simple vav "ו", non-standard double vav "וו" and sometimes by non-standard geresh modified vav "ו׳". Modern Hebrew has fewer phonemes than Biblical Hebrew but it has developed its own phonological complexity. Israeli Hebrew has 25 to 27 consonants and 5 to 10 vowels, depending on the speaker and the analysis. 1 In modern Hebrew /ħ/ for ח has been absorbed by /x~χ/ that was traditionally only for fricative כ, though some older Mizrahi speakers still separate these. 2 The glottal consonants are mostly elided in unstressed syllables, and sometimes also in stressed syllables as well, but are pronounced in careful or formal speech. In modern Hebrew /ʕ/ for ע has merged with /ʔ/ (א), though some speakers (particularly older Mizrahi speakers) still separate these. 3 Commonly transcribed /r/. This is usually pronounced as a uvular fricative or approximant [ʁ] or velar fricative [ɣ], and sometimes as a uvular [ʀ] or alveolar trill [r] or alveolar flap [ɾ], depending on the background of the speaker. 4 The phonemes /w, dʒ, ʒ/ were introduced through borrowings. 5 The phoneme /tʃ/ צ׳ was introduced through borrowings, but it can appear in native words as a sequence of /t/ ת and /ʃ/ שׁ as in תְּשׁוּקָה /tʃuˈka/. Obstruents often assimilate in voicing: voiceless obstruents (/p t ts tʃ k, f s ʃ x/) become voiced ([b d dz dʒ ɡ, v z ʒ ɣ]) when they appear immediately before voiced obstruents, and vice versa. Long vowels occur unpredictably where two identical vowels were historically separated by a pharyngeal or glottal consonant, and the first was stressed. Any of the five short vowels may be realized as a schwa [ə] when far from lexical stress. There are two diphthongs, /aj/ and /ej/. Most lexical words have lexical stress on one of the last two syllables, of which the last syllable is the more frequent in formal speech. Loanwords may have stress on the antepenultimate syllable or even further back. While the pronunciation of Modern Hebrew is based on Sephardi Hebrew, the pronunciation has been affected by the immigrant communities that have settled in Israel in the past century and there has been a general coalescing of speech patterns. The pharyngeal [ħ] for the phoneme chet (Hebrew: ח) of Sephardi Hebrew has merged into [χ] which Sephardi Hebrew only used for fricative chaf (Hebrew: כ). The pronunciation of the phoneme ayin (Hebrew: ע), has merged with the pronunciation of aleph (Hebrew: א) which is either [ʔ] or unrealized [∅] and has come to dominate Modern Hebrew; in many variations of liturgical Sephardi Hebrew, it is [ʕ], a voiced pharyngeal fricative. The letter vav (Hebrew: ו) is realized as [v], which is standard for both Ashkenazi and most variations of Sephardi Hebrew. The Jews of Iraq, Aleppo, Yemen and some parts of North Africa pronounced vav as [w]. Yemenite Jews, during their liturgical readings in the synagogues, will still make use of the older pronunciation of this Hebrew letter. The pronunciation of the letter resh (Hebrew: ר) has also largely shifted from Sephardi [r] to either [ɣ] or [ʁ]. Modern Hebrew morphology (formation, structure, and interrelationship of words in a language) is essentially Biblical. Modern Hebrew showcases much of the inflectional morphology of the classical upon which it was based. In the formation of new words, all verbs and the majority of nouns and adjectives are formed by the classically Semitic devices of triconsonantal roots (shoresh) with affixed patterns (mishkal). Mishnaic attributive patterns are often used to create nouns, and Classical patterns are often used to create adjectives. Blended words are created by merging two bound stems or parts of words. The syntax of Modern Hebrew is mainly Mishnaic, while also showing the influence of different contact languages to which its speakers have been exposed during the revival period and over the past century. The word order of Modern Hebrew is predominately SVO (subject–verb–object). Biblical Hebrew was originally verb–subject–object (VSO), but drifted into SVO. Modern Hebrew maintains classical syntactic properties associated with VSO languages—it is prepositional rather than postpositional in making case and adverbial relations, auxiliary verbs precede main verbs; main verbs precede their complements, and noun modifiers (adjectives, determiners other than the definite article ה-‎, and noun adjuncts) follow the head noun, hence in genitive constructions the possessee noun precedes the possessor. Moreover, Modern Hebrew allows and in cases requires sentences with a predicate initial. ואללה /ˈwala/ really!? Arabic والله‎ really!? ^ bitFormation. "Loanwords in Hebrew from Arabic". Safa-ivrit.org. Retrieved 2014-08-26. ^ "morfix dictionary". Morfix.mako.co.il. Archived from the original on 2013-01-07. Retrieved 2014-08-26. ^ a b bitFormation. "Loanwords in Hebrew from Russian". Safa-ivrit.org. Retrieved 2014-08-26. ^ bitFormation. "Loanwords in Hebrew from Turkish". Safa-ivrit.org. Retrieved 2014-08-26. ^ bitFormation. "Loanwords in Hebrew from Ladino". Safa-ivrit.org. Retrieved 2014-08-26. ^ אתר השפה העברית. "Loanwords in Hebrew from Akkadian". Safa-ivrit.org. Retrieved 2014-08-26. Choueka, Yaakov (1997). Rav-Milim: A comprehensive dictionary of Modern Hebrew. Tel Aviv: CET. ISBN 978-965-448-323-0. Ben-Ḥayyim, Ze'ev (1992). The Struggle for a Language. Jerusalem: The Academy of the Hebrew Language. Dekel, Nurit (2014). Colloquial Israeli Hebrew: A Corpus-based Survey. De Gruyter. ISBN 978-3-11-037725-5. Gila Freedman Cohen; Carmia Shoval (2011). Easing Into Modern Hebrew Grammar: A User-friendly Reference and Exercise Book. Magnes Press. ISBN 978-965-493-601-9. Shlomo Izreʾel; Shlomo Raz (1996). Studies in Modern Semitic Languages. BRILL. ISBN 978-90-04-10646-8. Matras, Yaron; Schiff, Leora (2005). "Spoken Israeli Hebrew revisited: Structures and variation" (PDF). Studia Semitica. Journal of Semitic Studies Jubilee Volume. 16: 145–193. Ornan, Uzzi (2003). "The Final Word: Mechanism for Hebrew Word Generation". Hebrew Studies. Haifa University. 45: 285–287. JSTOR 27913706. Bergsträsser, Gotthelf (1983). Peter T. Daniels (ed.). Introduction to the Semitic Languages: Text Specimens and Grammatical Sketches. Eisenbrauns. ISBN 978-0-931464-10-2. Haiim B. Rosén (1962). A Textbook of Israeli Hebrew. University of Chicago Press. ISBN 978-0-226-72603-8. Stefan Weninger (23 December 2011). The Semitic Languages: An International Handbook. Walter de Gruyter. ISBN 978-3-11-025158-6. Wexler, Paul (1990). The Schizoid Nature of Modern Hebrew: A Slavic Language in Search of a Semitic Past. Otto Harrassowitz Verlag. ISBN 978-3-447-03063-2. Zuckermann, Ghil'ad (2003). Language Contact and Lexical Enrichment in Israeli Hebrew. UK: Palgrave Macmillan. ISBN 978-1403917232. ^ "Hebrew". UCLA Language Materials Project. University of California. Retrieved 1 May 2017. ^ "Hebrew". Ethnologue. Retrieved 12 July 2018. ^ Hammarström, Harald; Forkel, Robert; Haspelmath, Martin, eds. (2017). "Modern Hebrew". Glottolog 3.0. Jena, Germany: Max Planck Institute for the Science of Human History. ^ Klein, Zeev (March 18, 2013). "A million and a half Israelis struggle with Hebrew". Israel Hayom. Retrieved 2 November 2013. ^ a b c Dekel 2014; quote: "Most people refer to Israeli Hebrew simply as Hebrew. Hebrew is a broad term, which includes Hebrew as it was spoken and written in different periods of time and according to most of the researchers as it is spoken and written in Israel and elsewhere today. Several names have been proposed for the language spoken in Israel nowadays, Modern Hebrew is the most common one, addressing the latest spoken language variety in Israel (Berman 1978, Saenz-Badillos 1993:269, Coffin-Amir & Bolozky 2005, Schwarzwald 2009:61). The emergence of a new language in Palestine at the end of the nineteenth century was associated with debates regarding the characteristics of that language.... Not all scholars supported the term Modern Hebrew for the new language. Rosén (1977:17) rejected the term Modern Hebrew, since linguistically he claimed that 'modern' should represent a linguistic entity that should command autonomy towards everything that preceded it, while this was not the case in the new emerging language. He also rejected the term Neo-Hebrew, because the prefix 'neo' had been previously used for Mishnaic and Medieval Hebrew (Rosén 1977:15–16), additionally, he rejected the term Spoken Hebrew as one of the possible proposals (Rosén 1977:18). Rosén supported the term Israeli Hebrew as in his opinion it represented the non-chronological nature of Hebrew, as well as its territorial independence (Rosén 1977:18). Rosén then adopted the term Contemporary Hebrew from Téne (1968) for its neutrality, and suggested the broadening of this term to Contemporary Israeli Hebrew (Rosén 1977:19)"
^ a b c Matras & Schiff 2005; quote: The language with which we are concerned in this contribution is also known by the names Contemporary Hebrew and Modern Hebrew, both somewhat problematic terms as they rely on the notion of an unambiguous periodization separating Classical or Biblical Hebrew from the present-day language. We follow instead the now widely-used label coined by Rosén (1955), Israeli Hebrew, to denote the link between the emergence of a Hebrew vernacular and the emergence of an Israeli national identity in Israel/Palestine in the early twentieth century." ^ Haiim Rosén (1 January 1977). Contemporary Hebrew. Walter de Gruyter. pp. 15–18. ISBN 978-3-11-080483-6. ^ אברהם בן יוסף ,מבוא לתולדות הלשון העברית (Avraham ben-Yosef, Introduction to the History of the Hebrew Language), page 38, אור-עם, Tel Aviv, 1981. ^ Sáenz-Badillos, Ángel and John Elwolde: "There is general agreement that two main periods of RH (Rabbinical Hebrew) can be distinguished. The first, which lasted until the close of the Tannaitic era (around 200 CE), is characterized by RH as a spoken language gradually developing into a literary medium in which the Mishnah, Tosefta, baraitot and Tannaitic midrashim would be composed. The second stage begins with the Amoraim and sees RH being replaced by Aramaic as the spoken vernacular, surviving only as a literary language. Then it continued to be used in later rabbinic writings until the tenth century in, for example, the Hebrew portions of the two Talmuds and in midrashic and haggadic literature." ^ Hobsbawm, Eric (2012). Nations and Nationalism since 1780: Programme, Myth, Reality. Cambridge University Press. ISBN 978-1-107-39446-9. , "What would the future of Hebrew have been, had not the British Mandate in 1919 accepted it as one of the three official languages of Palestine, at a time when the number of people speaking Hebrew as an everyday language was less than 20,000?" ^ Swirski, Shlomo (11 September 2002). Politics and Education in Israel: Comparisons with the United States. Routledge. ISBN 978-1-135-58242-5. : "In retrospect, [Hobsbawm's] question should be rephrased, substituting the Rothschild house for the British state and the 1880s for 1919. For by the time the British conquered Palestine, Hebrew had become the everyday language of a small but well-entrenched community." ^ Palestine Mandate (1922): "English, Arabic and Hebrew shall be the official languages of Palestine"
^ Benjamin Harshav (1999). Language in Time of Revolution. Stanford University Press. pp. 85–. ISBN 978-0-8047-3540-7. ^ Cf. Rabbi Hai Gaon's commentary on Mishnah Kelim 27:6, where אמפליא (ampalya) was used formerly for the same, and had the equivalent meaning of the Arabic word ğuwārib ("stockings; socks"). ^ Which words are marked as "New Words" in the Even-Shoshan Hebrew Dictionary, s.v. חצילים; see: Modern Hebrew usages. Ḥashmal is found only once in the Hebrew Bible, in Ezekiel's vision of the chariot (Ezek. 1:4; 1:27), but has been explained in a medieval Judeo-Arabic lexicon (reprinted in the book, Jewish Culture in Muslim Lands and Cairo Geniza Studies, ed. Yosef Tobi, Tel-Aviv University: Tel-Aviv 2006, p. 61 [note 114]) as being some angelic entity which had "utmost strength". Others have explained it to mean an angel that changes hues. ^ Compare Rashi's commentary on Exodus 9:17, where he says the word mesillah is translated in Aramaic oraḥ kevīsha (A blazoned trail); the word "kevīsh" being only an adjective or descriptive word, but not a common noun as it is used today. It is said that Ze'ev Yavetz (1847–1924) is he that coined this modern Hebrew word for “road.” See Haaretz, Contributions made by Ze'ev Yavetz; Maltz, Judy (25 January 2013). "With Tu Bishvat Near, a Tree Grows in Zichron Yaakov". Haaretz. Retrieved 27 March 2017. ^ Zohar Amar, Flora and Fauna in Maimonides' Teachings, Kfar Darom 2015, p. 157, s.v. שזפין OCLC 783455868, explained to mean "jujube" (Ziziphus jujube); Solomon Sirilio's Commentary of the Jerusalem Talmud, on Kila'im 1:4, s.v. השיזפין, which he explained to mean in Spanish "azufaifas" (= "jujubes"). See also Saul Lieberman, Glossary in Tosephta - based on the Erfurt and Vienna Codices (ed. M.S. Zuckermandel), Jerusalem 1970, s.v. שיזפין (p. LXL), explained in German as meaning, "Brustbeerbaum" (= jujubes). ^ a b Weninger, Stefan, Geoffrey Khan, Michael P. Streck, Janet CE Watson, Gábor Takács, Vermondo Brugnatelli, H. Ekkehard Wolff et al. The Semitic Languages. An International Handbook. Berlin–Boston (2011). ^ Hadumod Bussman (2006). Routledge Dictionary of Language and Linguistics. Routledge. p. 199. ISBN 9781134630387. ^ Robert Hetzron. (1987). "Hebrew". In The World's Major Languages, ed. Bernard Comrie, 686–704. Oxford: Oxford University Press. ^ Patrick R. Bennett (1998). Comparative Semitic Linguistics: A Manual. Eisenbrauns. ISBN 9781575060217. ^ Reshef, Yael. Revival of Hebrew: Grammatical Structure and Lexicon. Encyclopedia of Hebrew Language and Linguistics. (2013). ^ Olga Kapeliuk (1996). "Is Modern Hebrew the only "Indo-Europeanied" Semitic Language? And what about Neo-Aramaic?". In Shlomo Izre'el; Shlomo Raz (eds.). Studies in Modern Semitic Languages. Israel Oriental Studies. BRILL. p. 59. ISBN 9789004106468. ^ Wexler, Paul, The Schizoid Nature of Modern Hebrew: A Slavic Language in Search of a Semitic Past: 1990. ^ Izre'el, Shlomo (2003). "The Emergence of Spoken Israeli Hebrew." In: Benjamin H. Hary (ed. ), Corpus Linguistics and Modern Hebrew: Towards the Compilation of The Corpus of Spoken Israeli Hebrew (CoSIH)", Tel Aviv: Tel Aviv University, The Chaim Rosenberg School of Jewish Studies, 2003, pp. 85–104. ^ See p. 62 in Zuckermann, Ghil'ad (2006), "A New Vision for 'Israeli Hebrew': Theoretical and Practical Implications of Analysing Israel's Main Language as a Semi-Engineered Semito-European Hybrid Language", Journal of Modern Jewish Studies 5 (1), pp. 57–71. ^ a b c Dekel 2014. ^ Bolozky, Shmuel (1997). "Israeli Hebrew phonology". Israeli Hebrew Phonology. ^ a b R. Malatesha Joshi; P. G. Aaron, eds. (2013). Handbook of Orthography and Literacy. Routledge. p. 343. ISBN 9781136781353. ^ Li, Charles N. Mechanisms of Syntactic Change. Austin: U of Texas, 1977. Print. Hebrew Today – Should You Learn Modern Hebrew or Biblical Hebrew?